Our relationship with Kabam started over two years ago, when we partnered on three motion comics to promote their mobile fighting game, Marvel: Contest of Champions. Since this first collaboration, we've gone on to create almost thirty motion comics in total, with regular episodes being released each month in 2018. We've worked with Kabam on a wide variety of content both for Contest of Champions and for their successful mobile game Transformers: Forged To Fight, including 3D cinematic trailers and live action broadcasts, editorial and direction on community videos, and voice direction. In this case study, we’ll reveal the scope of the work across each franchise; the challenges and successes we faced; and the relationship we’ve built with Kabam over the years. To date, we’ve created nearly thirty Marvel motion comics, three 3D marketing spots including one live-action shoot completed in a four week period; and a variety of short-form social media content such as Instagram and Facebook posts. Across each Kabam project, we developed a bespoke creative strategy that would match the challenge we faced: we looked at what would excite the audience on a case-by-case basis, then throw our energies into the chosen solution. It’s all defined by one overarching goal: make something that people want to watch. And, thanks to a pipeline built from our gaming background, illustration and concept work – which stretches back to the creation of the world’s first motion comic – we have been able to tackle the project at speed. Our team approaches each backstory for Marvel Contest of Champions from a different angle. Although the shorts achieve a sense of continuity through their 2D format, the monthly releases straddle numerous tones, ranging from comedic, to dramatic, to action-packed. We also explore varying art styles to match each tone. The audience engagement with our motion comics has been consistent and impressive month over month. Our visuals, paired with Kabam's compelling storytelling, is a proven formula for success: over 4 million total organic views on YouTube with an average of 200,000 views per episode - and an excellent average retention rate of 76%. Our motion comic artwork is often used to boost the social media presence of CoC across their platforms, most significantly its Facebook page which is nearing 1 million likes to date. The volume of content we've created acts as a virtual pick-and-choose library of ready to use content that can easily and quickly be repurposed by Kabam as needed. 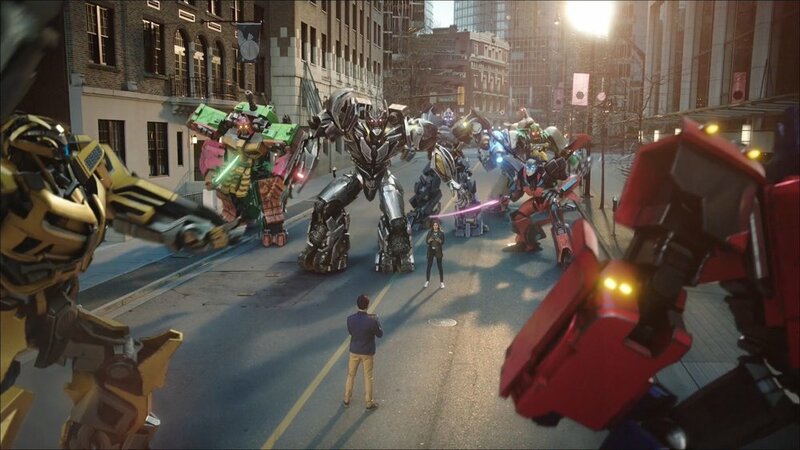 The younger Transformers: Forged To Fight property has led us to even bigger and better collaboration opportunities with Kabam since its release in spring 2017. The evolution from a small run of motion comics to 3D in-game cinematics and a 30-second broadcast television spot is a testament to the strength and trust developed in our relationship with Kabam. Under the tight turnarounds of the Transformers CG trailers, we innovated to deliver beautiful, high-end models that would excite fans of the 30-year franchise. You won’t realize when you see it, but our live-action broadcast spot took only our small, nimble team of talented artists to animate, light, render and composite. For the live action spot, we had four weeks from green light to completion. Thanks to our well-established network within the Vancouver film industy, we were able to quickly crew up, secure a cast, shut down a city street, and get to work. We delivered the initial edit one day after the shoot. The final spot was broadcast in the U.S and internationally.